This was my first week back to work and I have beyond struggled! While Harper is safe with her Papa during the day, I HATE leaving her in the mornings. I’m so afraid that I will miss the first time she crawls, walks or any of the other milestones. And the bonding time! Sooo it probably wouldn’t surprise you to know that I cried the entire way to office on Monday. I didn’t just have tears streaming my cheeks, I was doing the “ugly” cry. Mike and I started the Muffin Top-Less challenge on Monday morning at 5AM. Harper woke up at 3:00AM for a bottle and didn’t go back to sleep until after 4. Working out before pumping milk isn’t a good idea…never again will I make that mistake! I was just too sleepy to assemble the parts and I wanted a power nap before beating my body up on leg training day. The next morning I was wiser and less prideful. I woke The Boy from his peaceful slumber to feed Harper while I pumped. BAM!!! Teamwork. Returning to a job after a four-five month leave is like starting a new one. Gotta get my sea legs on! I just keep praying for the WILL to sew and eventually be self employed. 1. Do as much meal prepping on Sunday as possible. Two days worth isn’t enough! 2. It’s okay to ask for help. 3. Piggybacking on #2, you can be a good mom without being “super”. 3. Instagram is AWESOME. I’m tardy to the party on this one. Ha! 4. 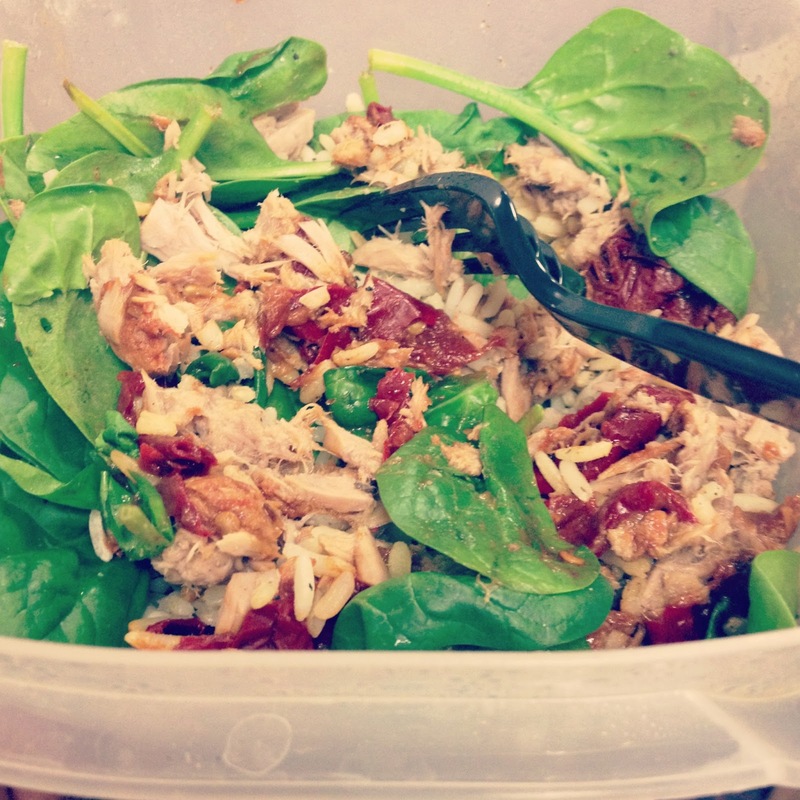 Spinach, tuna, peppers and brown rice LOVE each other. I’m trying to come up with a schedule that will allow me time with my family (of course) as well as time to blog, sew, clean, work and workout. What’s your favorite “hash-tag” on Instagram? Aww I know how it is. I cried when I had to leave my daughter. I only lasted 4 months and that was it for me. I became a permanent stay at home mom. I finally mailed the package this morning. Look out for it nezt week.